Tim Thompson is back tonight with another great guest review - take it away, Tim! 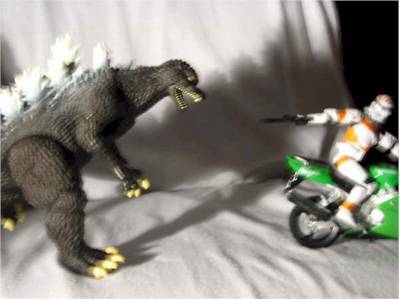 I’m back with another review, this time it’s for the FW Godzilla in the same series as the Gigan I reviewed before. I found him at the same place: my local CVS pharmacy. He was also $7.99; plus it was a buy-one-get-one-free sale, but I only got him since they didn’t have Anguiras. Adequate, open-front box. The back half is kind of flimsy, but It stands up to shelf wear fairly well. 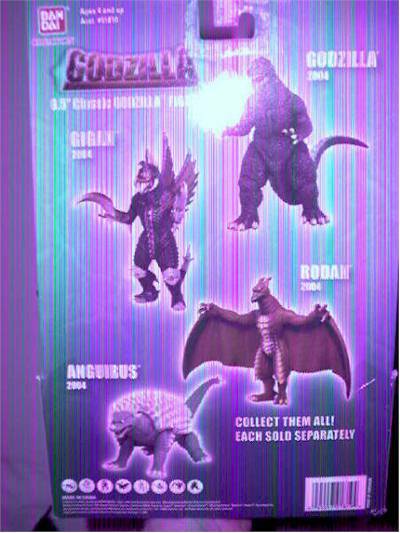 The back has an image of each monster in the line: Gigan, Rodan, Anguiras, and Godzilla. You can see the front, back, and entire left side of the figure, but it also leaves it vulnerable to sticky little hands. I was lucky enough to get the better of the two they had. 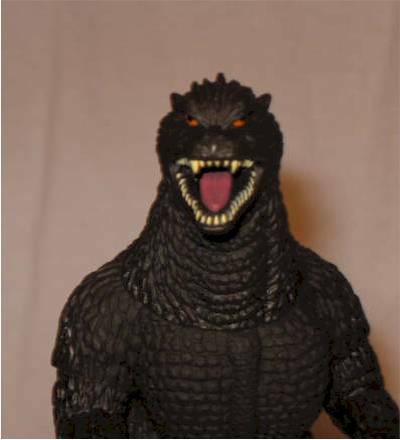 This is an amazing sculpt of the FW Godzilla. He’s not as soft a sculpt as you’d figure a standard rotocast toy being. From the rocky-texture on the spines to the individual scales all over his body, Bandai nailed it again. His arms and hands are a little skinnier than I remember, but I haven’t seen the movie in about a year. Each nail is unique on his fingers and toes. Small creases like a real claw are there and it really shows the quality that the modern toy companies are shooting for. His head is sculpted looking slightly to one side, and it’s a nice touch. Also, the majority of the spines are molded separate. It simplifies the molding process, but there is an obvious seam on his back. The application is ok, but not perfect. 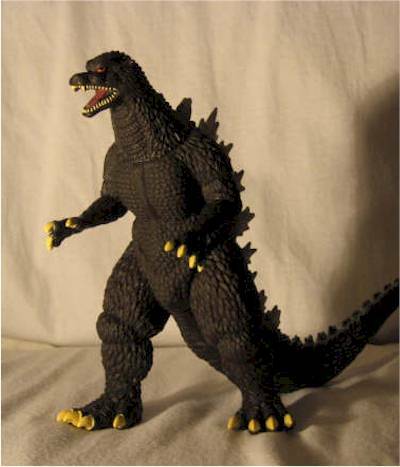 Less white could be used on the spines, maybe a single outline like was used on the Burning Godzilla I reviewed before. The white details go to the very tip of the tail, so that’s an improvement. They say the eyes are the windows to the soul, in this case it is almost true. The eyes are so realistic, I actually scared myself when I stared at them too long. I have no idea how to describe them, so I’ll let the pics speak fro themselves. He has the same as the Burning Godzilla only these are more useful thanks to the design: swivel arms, cut hips that let him take a decent step, a cut neck and he turns at the tail. This joint actually works, as the spot the tails is attached at is slightly bigger, allowing the tail to pivot up/down slightly. It could be possible in this packaging, but I don’t see it happening anytime soon. I’m glad he doesn’t have one, as I know of none that could be added and still keep him under $20. These things are perfect for adult collectors and children alike. 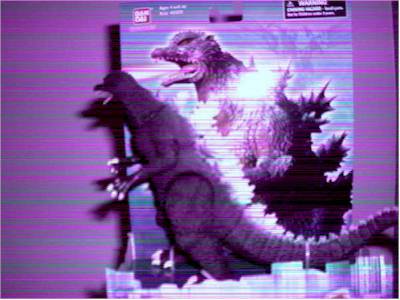 There’s nothing like seeing a kid terrorize his lego city with Godzilla, I know from experience. 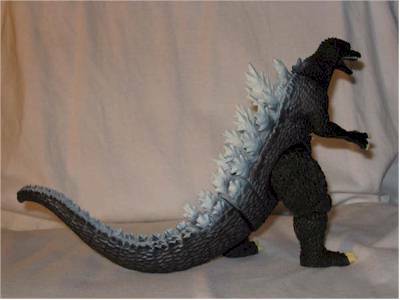 $7.99 for a 6” Godzilla that moves? I say that’s a pretty good deal, especially when they’re BOGO. Most specialty retailers online should have them. I’ve also seen some of the older series’ figures at TRU stores and at Sears Essentials. 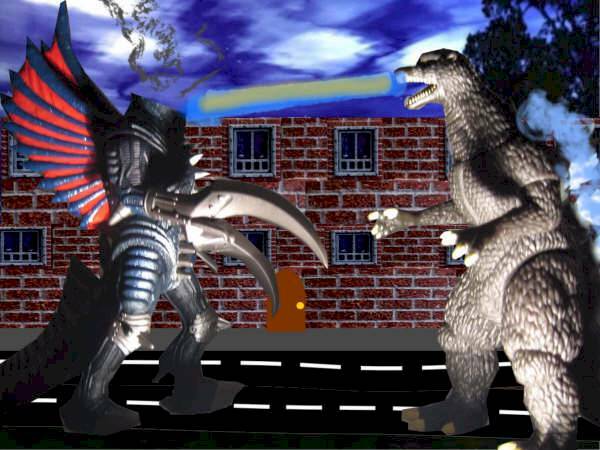 I reviewed Burning Godzilla and “Final Wars” Gigan earlier.